Indian economy is still not out of the woods as industrial production slackened to a four-month low of 3.6 per cent while retail inflation inched up to 5 per cent. New Delhi : Indian economy is still not out of the woods as industrial production slackened to a four-month low of 3.6 per cent while retail inflation inched up to 5 per cent. According to data released on Thursday by the CSO, the 3.6 per cent industrial production growth for September is lowest since 2.5 per cent rise in May this year. 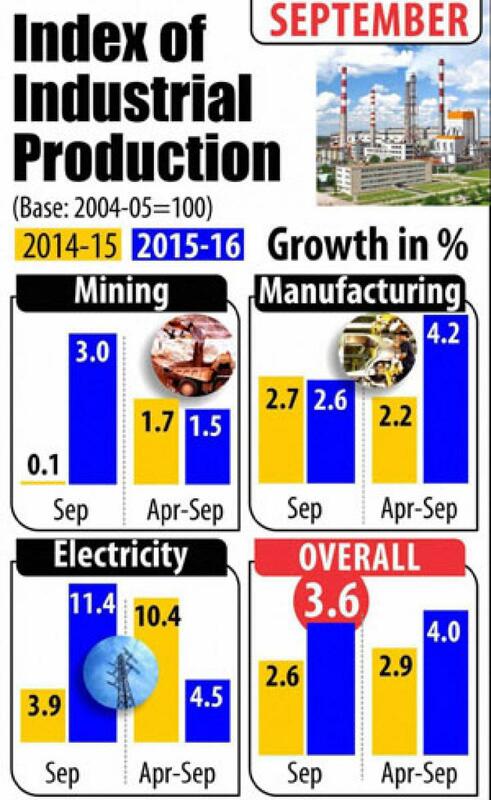 While the growth rate for the latest month is higher than 2.6 per cent rate recorded in September 2014, it has fallen sharply from 6.2 per cent in August 2015 mainly because of subdued performance of the manufacturing sector. The retail inflation rose to four-month high of 5 per cent in October compared with 4.41 per cent in September this year and 4.62 per cent in October 2014. This will be the last set of macro data this year RBI will consider before it heads into its policy review due in December.